Within dark and forgotten places hide the enemies of the Emperor! The Misericord ends up staying in port another 7 months longer than planned to compensate for their early arrival and avoid catching up with themselves at the next stop. Baronet Rieksdag is very interested in the acolytes' fate and keeps tabs on them during their quarantine. At the end of the quarantine period, Medicae Interrogator Sand announces that he has "interesting" information for Inquisitor Skane, which he will send to her via a dataslate he entrusts to the acolytes. He then gives them their medical release and they are allowed to access the station again. They are tasked, from their earlier mission briefing, with meeting Oberst Dray, who operates as a scrap picker in the Port Wander Market, the Court of the Dead. They bring along Baronet Rieksdag and Junior Purser Darl, who are growing a little restless with the long stay. Oberst Dray's tent stall is easy to find in the market. Rollando and him exchange views of their Inquisitorial rosettes. Dray closes his shop and tells his visitors he has some interesting news for the Inquisition: he believes he has located the Righteous Path. Aenid and Rollando have heard of this ship; the Righteous Path was supposedly laden with valuable goods but vanished hundreds of years ago. Its name is now mythical and pops up in legends and port tales. 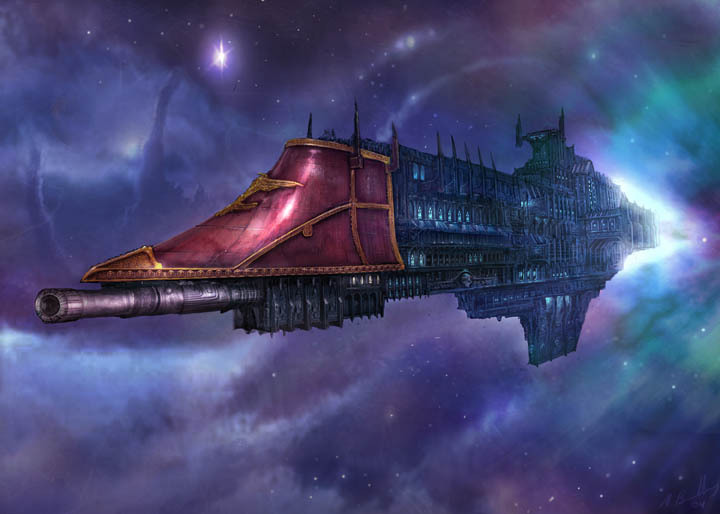 A friend of Dray's serving aboard the Rogue Trader Emperor's Testament was lost in the Koronus Expanse and caught a signal which the Astropaths eventually identified as coming from the Righteous Path before losing it again. A few people, including Dray's friend, escaped the Emperor's Testament on lifeboats before it too was lost, and now he hopes to make a little money by selling the information and location. The Righteous Path was in fact an Inquisition-chartered trader, so the Inquisition wants back. Since this means travelling beyond the borders of the Imperium, this requires finding a Rogue Trader. Junior Purser Darl agrees to help the acolytes find a reliable Rogue Trader but is wary about accompanying them. As they are discussing their plans, Dray falls over, clutching his head and moaning, "Get out of my head!" "Psyker!" Calpurnia exclaims, before knocking Dray unconscious. From the front, autogun fire sprays into the tent. Everyone drops to the ground, and Aenid scurries out the back while Calpurnia drags Dray behind cover; Rollando and Purser Darl peek out the front flap and, spotting a few thugs in gaudy uniforms, start shooting. Aenid goes around the tent to join them in the shooting, but the thugs shoot back. Baronet Rieksdag yells helpful instructions, and Calpurnia joins in the shooting. One after the other the thugs are picked out and the last one is captured as he tries to run. "It was Hadrek Fell! Captain Fell! From the Fell Hand!" wails the captive. "We were sent to protect Lady Ash. She ordered to fire into the tent and then she ran!" As Dray wakes up, they move to relocate to a safer and more discreet spot before station security arrives. The prisoner, whose name is 2463, has been for his entire life an indentured servant aboard the Rogue Trader Fell Hand. He knows very little; his captain has a nasty reputation as someone who does what it takes to get things done — his way. Dray and the acolytes figure the psychic attack was meant to grab the location of the Righteous Path from his mind. Purser Darl goes in search of a Rogue Trader they can trust to race to the Righteous Path. She returns with Seneschal Vilm Estigos of the Rogue Trader Sabre.